Hello guys, welcome back to our website. Today I want to share about “do nosebleed dangerous”? So, do you ever feel it? How it feels? Are you already know why your nose bleeding? Well, let’s start our discussion about nose bleeding today. 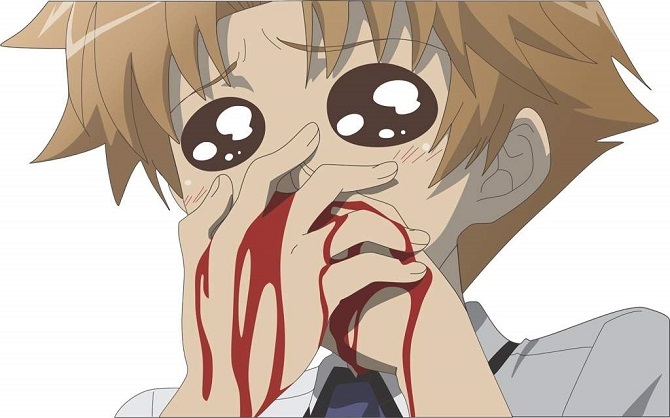 We can say nosebleed is the most common thing in anime or manga. This thing always happens when the character meets the “heroine” from their series. According to me, this reaction (Nosebleed) is a sign that the boy or girl from the anime or manga is attracted to the heroin. Why nosebleed? Because there are some rules in TV shows all over the world. The television shows are not allowed to showing any sexual content to cartoon, anime or manga, that’s really prohibited. So, do you know what is nosebleed? Do you know the meaning of nosebleed to your body? Well, if you can’t answer my question, I will give you a little explanation about nosebleed to you. Nosebleed or also known as epistaxis is the common occurrence of bleeding from the nose. It is usually will get a noticed from the person itself because of the blood drains out from their nose. Nosebleed isn’t as scary as it looks like. This is not a disease. This, as a result, your body need a rest or maybe your body get damaged and caused internal bleeding. Well, I will be telling you anything that maybe can cause a nosebleed. Here are a few of them. You are probably scratching your nose inner part and leaving a scar in them. As the result of this unfortunate accident, you will get a nosebleed. The irritation because of a chemical compound like ammonia. It seems like you are an alcoholic, this also can lead you to more dangerous part of nosebleed. Dysfunction of body ability to stop bleeding like hemophilia. Climate change in humidity or temperature of both of them. This also can be the cause of nosebleed even the possibility of climate change also affecting you is very small. Well, I will suggest you find a doctor as soon as possible to check your medical condition if you also experiencing nosebleed for more than 30 minutes, you get nosebleed regularly, you’ve lost a lot of your blood and this still not stop, you swallow your own blood and cause you to vomiting. If this is somehow happening to you. Please, for your own sake, find the nearest doctor or ask someone to take you there. Well, there are so many of you will be questioning now. How to stop a nosebleed, right? Well, to stop nosebleed there are a few ways. Sit down calmly, don’t panic, pinch the soft part of your nose tightly. Place an Icepack or Freezing fruit or veggies covered by towel right on the bridge of your nose. Stay upright, rather than lying down, this reduces the pressure in blood vessels of your nose. Well, even because this is not a dangerous disease, you still need to aware to this. Check yourself to a doctor while there’s still a chance because there is nothing more expensive than your own life and health. I hope this information about “do nosebleed dangerous” is useful for you. As always, please share this article with your friends or families if you find this article useful. Thanks for reading my article, see you guys.